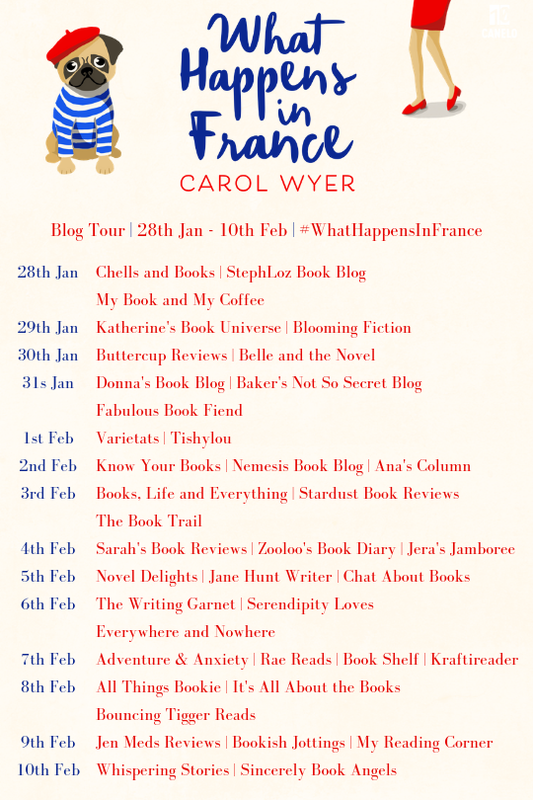 Today is my stop on the blog tour for What Happens in France by Carol Wyer, and I'm very excited to be sharing this story of friendship, love and loss with you. "She stood and took her place in front of the camera... It was now or never"
With the help of handsome teammate Lewis, it's not long before she's on a private jet heading for the stunning beauty of rural France. With a social media star dog, a high maintenance quiz host and a cast of truly unique characters, Bryony and Lewis have their work cut out for them to stay on the show and in the public eye. 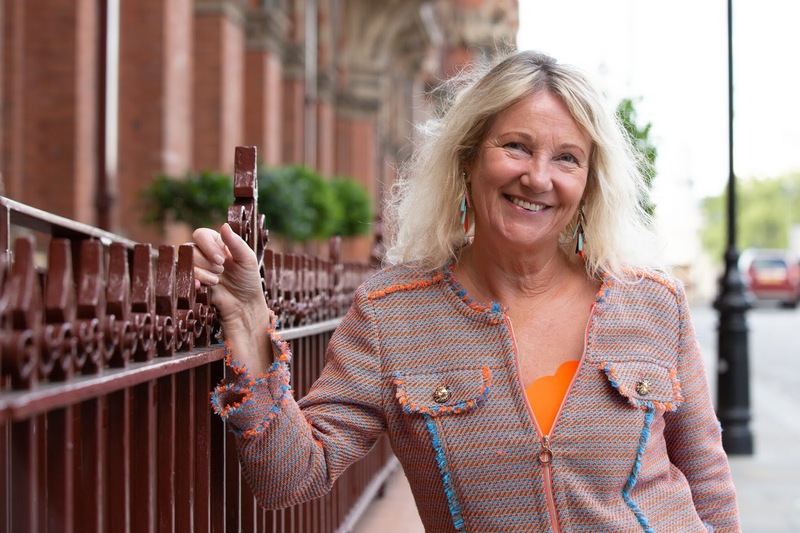 Carol won The People's Book Prize Award for non-fiction (2015), and can sometimes be found performing her stand-up comedy routine Laugh While You Still Have Teeth. What Happens in France tells the story of Bryony Masters, who has not seen her sister Hannah for thirty years, after she ran away as a teenager. But now Bryony's father is seriously ill, and he is desperate to be reunited with his eldest daughter. In order to raise awareness and help find Hannah, Bryony enters a gameshow called What Happens in France. Along with her teammate Lewis, she has to complete challenges in order to stay on the show and appeal to the millions of viewers. Will she be able to reconcile with Hannah? And will her friendship with Lewis be a lasting one? As soon as I saw the cover for this I knew I was going to like it - seriously, look at that adorable dog! It's the perfect introduction to this cute, heartwarming story too. 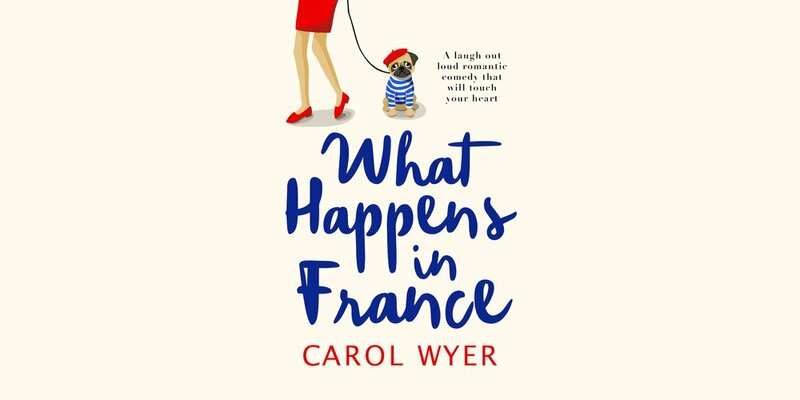 What Happens in France is the perfect kind of book to cheer you up in this dark, cold season as it just bursts with joy, laughter and light. There are a wealth of likeable characters in this book, from Bryony's friend Melinda to fellow game show competitors Jim and Oscar - and particularly Oscar's Instagram-famous pug Biggie Smalls. I found myself really rooting for a lot of them, with one notable exception: the loathsome, self-obsessed game show host. I relished having someone to dislike in this otherwise very positive character group (this makes it sound like I enjoy hating characters, which I guess I kind of do haha!). I really enjoyed reading about all the action of the game show. Obviously, set in France, it conjured up some beautiful images and the descriptions of the locations had me halfway to Dover to catch a ferry straight over there. The hi-jinx of the show were very funny to read, and managed to balance out Bryony's agony and guilt over her sister's disappearance with silliness and fun. It's an interesting way to mix the serious with the frivolous and I found myself racing through the pages. However, without any spoilers, I would say that this gets pretty emotional at the end! I definitely had to read the last few pages through tears, but I was very moved and it made me fall even more in love with this book. This is a romantic comedy so of course there's a little bit of confusion over matters of the heart. The course of true love never did run smooth and all that, but I enjoyed how realistic this relationship felt. I also really liked that the romance wasn't constantly shoved in our faces - this story is about so much more than just 'girl meets boy' and it was quite refreshing to have a rom-com in which, while he is helpful, the man isn't the answer to every problem the women has. Overall, this is a beautifully written, highly engaging book that manages to combine the agony of a missing relative with funny, lighthearted action. I found myself smiling as I read it, and I loved how hilarious and moving it was. I loved reading this and would love to read more - particularly about the gorgeous Biggie Smalls! Be sure to check out the other blogs hosting What Happens in France on this tour!